Annatto extract is a natural red to yellow food dye derived from the achiote tree. 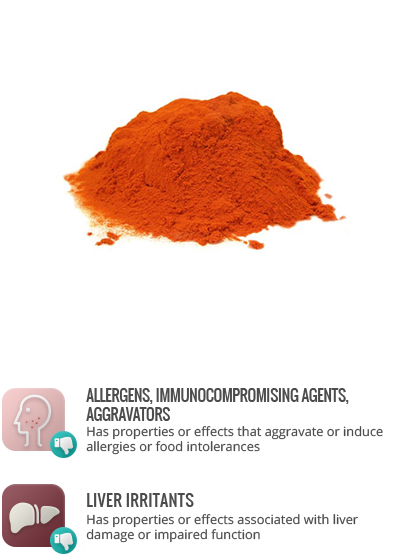 The color is formed by the carotenoids bixin and norbixin. See: Annatto. Bixin in annatto extract is a known antioxidant and has been associated with improved cell-to-cell communication, which may be cancer protective. Annatto extract has been found to cause hypersensitivity reactions in expected doses. In animal studies of very high intake, annatto increased the effects of mutagenic chemicals on bone marrow cells, but did not have its own mutagenic effects. Studies of high intake in rats also led to increased liver weight and overgrowth of liver cells. See: Annatto.